Melia, U.; Guaita, M.; Vallverdu, M.; Clarià, F; Caminal, P.; Embid, C.; Vilaseca, I.; Salamero, M.; Santamaria, J. Linear and non-linear measures applied to heart rate variability (HRV) can be used to quantify modulation of the sympathetic and parasympathetic branches of the autonomic nervous system. RR signals were obtained from the ECG recorded during five Maintenance of Wakefulness (MWT) and Multiple Sleep Latency (MSLT) tests alternated throughout the day from patients suffering sleep disturbance. Two different end-points were considered: Study A, excessive daytime sleepiness (EDS) versus without daytime sleepiness (WDS); Study B, Pre-CPAP versus Post-CP AP (continuous positive airway pressure therapy) in EDS. Measures obtained from spectral analysis (PSD), time-frequency representation (TFR), auto-correntropy (ACORR) and auto-mutual-information function (AMIF) were applied to describe autonomic nervous system activity and RR regularity. Statistical differences between EDS and WDS groups were found in MSLT events. During MSLT, the parasympathetic activity and RR regularity in EDS were affected by CPAP therapy. Non-linear measures obtained from EDS in Post-CPAP differed from Pre-CPAP (p-value<0.05) and tended to be similar to WDS. Linear and non-linear measures applied to heart rate variability (HRV) can be used to quantify modulation of the sympathetic and parasympathetic branches of the autonomic nervous system. RR signals were obtained from the ECG recorded during five Maintenance of Wakefulness (MWT) and Multiple Sleep Latency (MSLT) tests alternated throughout the day from patients suffering sleep disturbance. Two different end-points were considered: Study A, excessive daytime sleepiness (EDS) versus without daytime sleepiness (WDS); Study B, Pre-CPAP versus Post-CP AP (continuous positive airway pressure therapy) in EDS. Measures obtained from spectral analysis (PSD), time-frequency representation (TFR), auto-correntropy (ACORR) and auto-mutual-information function (AMIF) were applied to describe autonomic nervous system activity and RR regularity. Statistical differences between EDS and WDS groups were found in MSLT events. During MSLT, the parasympathetic activity and RR regularity in EDS were affected by CPAP therapy. Non-linear measures obtained from EDS in Post-CPAP differed from Pre-CPAP (p-value<0.05) and tended to be similar to WDS. Melia, U. [et al.]. 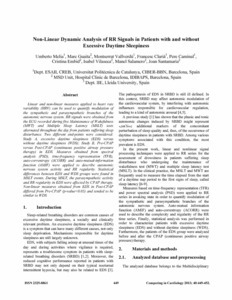 Non-linear dynamic analysis of RR signals in patients with and without excessive daytime sleepiness. A: Computing in Cardiology. "Computing in Cardiology 2013, vol. 40". Zaragoza: Institute of Electrical and Electronics Engineers (IEEE), 2013, p. 449-452.